Then again, few musicals draw on more ambitious source material, or are more faithful to the spirit of that material — in this case, E.L. Doctorow’s brilliantly panoramic novel, which blended fictional characters with such historical figures as Emma Goldman, Henry Ford, Booker T. Washington, J.P. Morgan, and Harry Houdini to tell the story of America in the first decade of the 20th century while foreshadowing the convulsive years that lay ahead. Those reverberating connections between present and past help to shape our experience of Barrington Stage Company’s enthralling new production of “Ragtime’’ right from the show’s opening moments. Director Joe Calarco has devised a prologue that drives home the fact that “then’’ and “now’’ are but different points on the same continuum. Wearing contemporary attire, several principal cast members walk into an attic that is crammed with old-fashioned lamps, chairs, trunks, a rocking horse, a Victrola, and a piano. Above the stage hang three large, wooden windows, canted at an angle, in what is likely a nod by set designer Brian Prather to the three groups of characters whose lives will eventually intertwine. The actors gaze at and touch the artifacts; one performer sits down at the piano and begins to pick out a melody. Then, slowly, they begin to change into period garb. And just like that, we are thrust headlong back to New Rochelle in 1902, and into a tale that will dramatize and illuminate issues that remain urgent today, from racial injustice to women’s empowerment to the struggles of immigrants in a hostile new land. 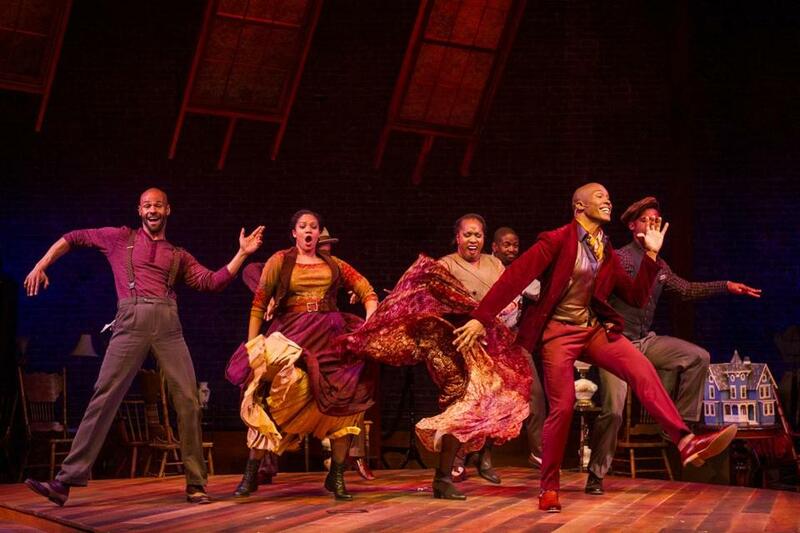 Of course, it’s not enough to capture all that social ferment; any “Ragtime’’ has to deliver as entertainment, too. And that obligation Barrington Stage’s production fulfills, thrillingly. This is a musical that can sometimes sag a bit in Act 2; most of the best songs are in Act 1. But director Calarco’s flair and insight help maintain the show’s vibrancy throughout, buoyed by strong performances from his skilled cast. The performances are especially vivid in the three key roles that carry most of the show’s emotional weight. One of those roles is Mother, an affluent white woman who registers as a figure of warmth, strength, and ready-for-anything poise in Elizabeth Stanley’s superb portrayal. The marriage between Mother and Father (David Harris) is cordial but distant, and grows more so when he returns from a lengthy trip to find his household, and his wife, greatly changed. Their eerily prescient son Edgar (Elliot Trainor) keeps crying out “Warn the duke!,” having apparently foreseen the assassination that will trigger World War I a decade later. Mother’s firebrand Younger Brother (Hunter Ryan Herdlicka) keeps searching for a cause to which he can attach his passion, especially after his declaration of love to songstress Evelyn Nesbit (Leanne A. Smith) is not reciprocated. Younger Brother’s encounter with Goldman (Anne L. Nathan, excellent) proves transformative. A second key role is Coalhouse Walker Jr., an African-American pianist. Darnell Abraham delivers a powerhouse performance as Coalhouse, communicating the character’s joyous embrace of life at the start and his icy, resolute fury when events spur him on to a quest for revenge. Before that quest, Coalhouse and his estranged girlfriend, Sarah (Zurin Villanueva), reunite at Mother and Father’s house after a dramatic episode involving Coalhouse and Sarah’s baby. Villanueva delivers a shiver-inducing rendition of “Your Daddy’s Son,’’ and she and Abraham team up for a galvanizing “Wheels of a Dream,’’ heartbreaking in its expression of hopes that will soon be cruelly dashed. The third key role is a Jewish immigrant from Latvia, Tateh (J. Anthony Crane), who is fiercely protective of his young daughter (Frances Evans) as they struggle to make their way in America. Crane makes us feel Tateh’s desperation, and his determination, too, as the immigrant barely survives living in tenements and working in brutal factories before he has a brainstorm about a way to make money — and art — from paper silhouettes. Early in “Ragtime,’’ Crane teams up with Stanley and Harris for a soaring performance of “Journey On,’’ as Tateh and Father are passing each other on different ships: the former arriving in America for the first time, the latter heading off on an expedition to the North Pole. Compared to that, the drive to Pittsfield is nothing — and this “Ragtime’’ is well worth the trip.